I have a small oil leak and I think its coming from this plastic tank. 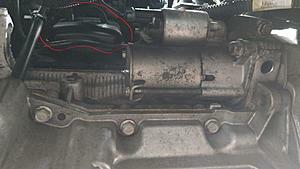 It's attached just in front of the engine block to the left of the starter as you're looking at the engine. Is that the vacuum tank? Does it have hoses going to it from up top? That is the vacuum tank. Yes, I finally figured out it was that vacuum tank. Not sure why it appears to have oil leaking from it though. I wonder if running it at VIR cracked it and some bypass oil from the turbo is in there leaking. I noticed in 3rd gear it would go to 22 PSI or so, then near the top of 3rd gear it would only be producing around 15PSI. Does anyone know if the one from the regal fits? I'll take a closer look. Any ideas as to what could be above it that would likely be causing the leak? Oil leaks are a pain to track down, it could be you cracked the tank and some bypass oil leaking. You don't have to replace the tank you can bypass it without effecting the cars operation. I'd start with a boost leak test, because if thats cracked you'll know right away. Then clean the engine bay really well and see if it keeps leaking. Just wanted to follow up on this thread and say that the leak was indeed coming from that tank. I ended up getting a replacement tank and no more leak. Meh, I use about a quart of oil each 20 minute session when I'm on the track. I'm sure it is burning it, but it's done it since the day I bought it so I just keep running it. Oil is definitely getting into the intercooler and piping. I've seen it in there. Still runs great! I guess I'll take a look at the PCV just to make sure it's working properly. Under normal street usage, it uses no oil whatsoever. 10 bucks ur pcv valve is shot, letting boost into crank case, and pushing oil into intake system and past rings. Could be. I don't see a lot of smoke (nor has anyone behind me mentioned it). But I'm also not seeing oil on the ground... so it's gotta be getting burnt. Any quick way to test the PCV? I just searched and didn't see much about it other then cleaning valves. My car does the same thing, oil in intake and burns oil in boost with excessive crankcase pressure. When I inspected my pcv valve I found it stuck open allowing boost pressure directly into crankcase.i replaced the pcv valve and it lasted a day before it started doing it again. out of boost it does perfect...I would like to block the pcv passage in intake/head and install one in the valve cover with a catch can and check valve between intake vacuum and the pcv valve. take off intake manifold, tap out the back of the pcv port hole in the manifold with 1/8 npt. install plug with locktite. then on the top ridge on the outside of the manifold above where pcv port hole is, drill and tap 1/8 npt , install 1/8 npt to an 6 or barb fitting, and there u go, u now have a way to run to catch can. but its not as simple as that to make the system work correctly. im working on a system to make it work right. stay tuned. almost done. not really, have to take off intake manifold and remove valve. see if u can blow through both ways. should only be able to from big end. Anyone know exactly what this part is? Pioneer sub part# Anyone know it, or have one FS? Pioneer Subwoofer Part# ? Anyone know it off-hand? Does anyone know the part number for LSD? Quick Reply: Anyone know what this part is?